I'm not dead, don't worry. I'm working on something. I'm working and living in DC for the summer. I live near the Shaw stop on the Green Line of the Metro, which is a dream come true for me; I've always wanted to live here. When I'm not at my job and I'm not with friends and I'm not stuffing my face, I'm stuffing my head with Ruby on Rails and working on my newest, biggest project called Moodstring (MoSt for short). 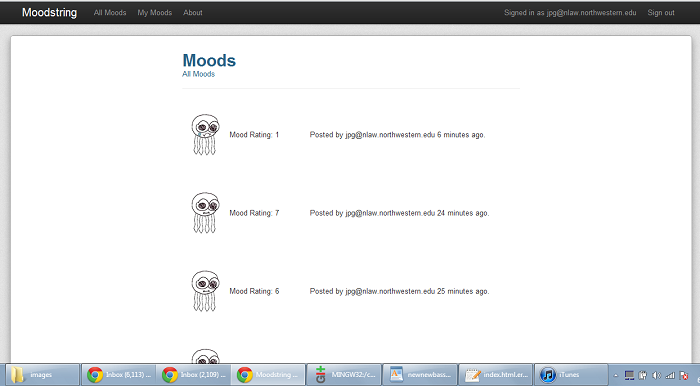 I'll have a very early test version of the site up soon at moodstring.com. I haven't really started working on the layout yet, and most of the features that the site will eventually have aren't done or even started yet, but the site will technically be functional: You can register an account, log in, and post your mood on a scale from 0 to 10. There's a lot more to MoSt than it might seem like though. It has huge potential for data collection, advertising, self-improvement, and social networking that won't really make sense until I post the actual pitch for the website, which I'm not going to do yet. So keep checking back and I'll keep you posted on the site. In the meantime I guess I'll also post doodles and stuff. There's a ton of stuff that I've been wanting to post on this clog--articles, cartoons, other things--that I haven't gotten around to posting. Make me do that please; yell at me.